Discover the weird and wonderful collections dotted across the country as we take a look at some of the nation’s quirky museums. Inspired by his grandmother’s Chinese cabinet, Charles Paget Wade saved his childhood pocket money to buy curios of his own. He grew up, became an architect, and bought Snowshill Manor in the Cotswolds in 1919 which was in a ruinous state. Undaunted, he set about its restoration. His family motto, ‘Let nothing perish’ couldn’t be more appropriate for a man who spent his life amassing a truly spectacular collection of everyday items as well as extraordinary objects from around the world. He filled his house with so many things – including Samurai armour – that he decamped to the adjacent cottage, thus reserving the manor for his collections and for entertaining. Today, the thousands of items are displayed just as Mr Wade intended, without labels: clocks, bicycles, automatons, toys and musical instruments. In a house in Worksop it is forever 1923, the date that the Straw family bought their semi-detached house with the proceeds from Mr Straw senior’s successful grocery and seed merchant business. They threw little away and chose to live without many of the modern comforts we take for granted. Costing £767 – a further £100 being spent on decoration – the house was fashionable with carpets and wallpapers from Sanderson in London. When their mother died in 1939, the two sons, Walter and William, left everything exactly as it was, so the house is filled with food packaging in the cupboards, clothes in the parents’ bedroom, piles of papers and sheet music on the piano – even William’s polished shoes, ready for his walk to church on Sunday. Robert Opie began collecting packaging at the age of 16 with a packet of Munchies, and built up a collection that now extends to all aspects of daily life. “There is no one item in the collection which stands above the rest, no one item which is more important. Only when seen together – rather like a jigsaw puzzle with every piece in place – do they form a picture,” says Robert. 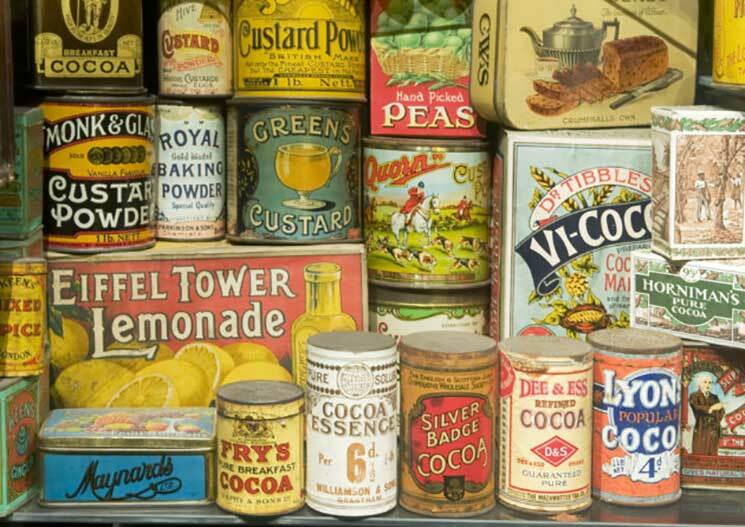 There are more than 12,000 original items on display at the Museum of Brands which tell the remarkable story of over 150 years of British consumer society. It’s a journey from Victorian times to the present day that reveals how brands have become entwined with our lives. As Robert says: “It’s all here: the brands, the packs, posters and adverts, evoking and inspiring, a kaleidoscope of images and iconic brands.” Opie’s film In Search of Our Throwaway History is a remarkable story of our consumer age. Where Mr Straw’s House didn’t even have a wireless set, the Bill Douglas Centre houses one of Britain’s largest public collections of ephemera relating to the history and pre-history of cinema. Bill was a film-maker and the remarkable collection of items he assembled with his friend Peter Jewell founded the museum at the University of Exeter. Visitors can see everything that is associated with film and television: cigarette cards, games, letters, handbills, jigsaw puzzles, magic lanterns and slides, optical toys, magazines, photographs, posters, programmes, records, sheet music, and ransparencies. They illustrate the development of optical recreation and popular entertainment from the late 18th century to present day. The collection is based around audiences experience of the moving image and very deliberately ranges from the sublime (an original Lumiere Cinematographe for instance) to the ridiculous (Chaplin bottle stops and Mickey Mouse telephones). John Bowes, a wealthy businessman, and his French wife, Joséphine embarked on something quite remarkable in the 19th century: to build a museum in the French chateau style, in County Durham. The prospect was a daunting one – to create a truly magnificent building suitably fitting for all the precious treasures which would be contained within it. The foundation stone was laid in 1869 and as the building grew, so did the Bowes’ collections. Of particular interest is the Silver Swan musical automaton which dates from 1773. The life-size swan is controlled by three separate clockwork mechanisms – it first rests on a stream made of twisted glass rods interspersed with silver fish. When the mechanism is wound up, the glass rods rotate, the music begins and the swan twists its head to the left and right and then appears to preen its back. It then bends down and catches a fish which it then swallows as the music stops. Quite magical! Discover Britain June/July 2018 is out now! What lies beneath London’s streets?